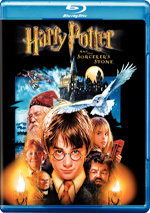 In Harry Potter and the Prisoner of Azkaban, Harry Potter and his friends Ron and Hermione return as teenagers to Hogwarts School of Witchcraft and Wizardry for their third year of study, where they delve into the mystery surrounding an escaped prisoner who seems to pose a dangerous threat to Harry. $93.687 million on 3855 screens. That meant the third flick, Harry Potter and the Prisoner of Azkaban, came out during the busy summer 2004 schedule. This may have been a mistake. Prisoner certainly earned good cash, as it took in $249 million. However, it showed the second consecutive Potter decline. Stone nailed $317 million, but that dropped to $261 million for Chamber. Prisoner didn’t mark a big drop from the others, but it continues to slip, and since the flick got generally good reactions, it might have fared better with an end of the year release. Just like the first two films, Prisoner opens between school terms with Harry (Daniel Radcliffe)at home with his unpleasant relatives. When he uses magic to make his nasty Aunt Marge (Pam Ferris) inflate and fly away, a row ensues and Harry flees. Happily for him, the “Knight Bus” - a transport for displaced witches and wizards - comes to get him. He heads to the Leaky Cauldron, but along the way, he learns that murderous sorcerer Sirius Black (Gary Oldman) - the titular prisoner of Azkaban and a supposed supporter of ultra-evil Lord Voldemort - escaped. For the first time, someone other than Chris Columbus directs a Potter flick. One will likely find it difficult to tell, however, as Alfonso Cuarón doesn’t exactly leave a strong mark on the material. He got much of his fame in America from 2002’s Y Tu Mama Tambien, a fairly raunchy “coming of age” tale that featured lots of sexual content. That seems like an odd basis on which to select the director of a Potter effort, and Cuarón comes across as unsure of himself in these surroundings. Maybe “unsure of himself” isn’t the correct term, but Cuarón fails to give Prisoner a distinctive feel. If you didn’t know that someone other than Columbus directed the movie, you wouldn’t be able to tell from the action onscreen. I’d say that Prisoner presents a slightly darker tone than its predecessors, at least at times. Cuarón manages to make elements like the dementors appropriately scary, but otherwise, I see little to make the flick come across as different from the prior efforts. Some might regard that as a good thing. After all, the previous Potter movies did well, so why alter the formula? Then again, why bother to get a new director if we’re going to get the same old thing? I don’t mean to harp on Cuarón heavily, but I admit the sameness that came with Prisoner was a disappointment. I hoped the change in director would bring a new spirit to the movie and make it more distinctive. Instead, it works in a manner very similar to the first two. I thought those lacked good story development, and that happened here as well. For filmmakers, the biggest problem with the Potter films relates to the source material. By that I mean that they need to make good movies but they also need to satisfy the legions of fans who adore the books. Those are long tomes and apparently filled with lots of moments that don’t necessarily further the plot. Those elements may work fine on the printed page, but they slow down a movie. It’s shocking to realize that at 142 minutes, Prisoner is the shortest of the three flicks. The first two were too long, and that flaw continues to mar Prisoner. It’s all about the exposition, which progresses at a snail’s pace. Some will argue that the views of daily life at Hogwarts give Potter its distinctiveness, but I feel that enough is enough. We saw lots of those establishing moments in the first two flicks; now they’re just tedious. On the negative side, the story seems awfully familiar. Does Harry ever deal with anything other than people who want to kill him? There’s not much else to the plot, and this sense of déjà vu mars the movie. It’d be nice to see a flick in which there isn’t an ominous threat hanging over Harry’s head. This makes him more of a reactive character than anything else, though the third act allows him to become more involved in his own fate. It doesn’t help that Radcliffe continues to be a bore as Harry. I cut him slack in the first movie since I thought the story wanted him to start out as a cipher so he could better develop later. Unfortunately, that doesn’t seem to occur here. He’s still flat and without much personality. 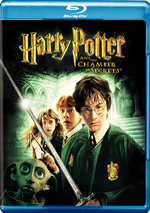 Harry Potter and the Prisoner of Azkaban appears in an aspect ratio of approximately 2.40:1 on this Blu-ray Disc. Although neither of the first two Potter Blu-rays looked especially great, Azkaban made up for that with an exceptional transfer. Sharpness seemed excellent. The movie consistently looked detailed and accurate. I noticed virtually no signs of softness during this distinct and well-defined movie. Jagged edges and moiré effects caused no concerns, and edge enhancement seemed absent. A little grain crept in at times, but not as much as during the first two flicks. The movie otherwise looked free from flaws, as I noticed no specks, marks, or other issues. Prisoner didn’t exactly feature a sizzling palette. However, it varied hues well enough, and the disc displayed these nicely. The different colors came across as vivid and bold when necessary. The hues never showed any problems like noise or bleeding, as they stayed tight and clearly reproduced. Black levels looked particularly solid, as they portrayed deep tones, while shadow detail appeared quite smooth and appropriately visible. Low-light situations seemed very neatly defined and suffered from no excessive opacity. The image of Prisoner came across well and offered the strongest transfer of the three movies. Although not as memorable as the image, the PCM 5.1 soundtrack of Prisoner was fine. Much of the track maintained a focus on the front, but within that spectrum, the audio seemed smooth and lively. Music presented good stereo imaging, while effects popped up in their appropriate locations and blended together cleanly. Elements moved from one channel to another in a natural manner. At times, I thought the surround usage seemed little too reserved, but when the rear speakers really kicked into action, I better appreciated the mix. A few sequences used the surrounds to good advantage. These lacked the impressiveness of the action pieces from the first two movies, but they still involved the listener well. Audio quality appeared solid. Speech seemed natural and warm, and I detected no issues related to edginess or intelligibility. Music probably could have been a little more prominent in the mix, as it occasionally appeared a little buried. Nonetheless, John Williams’ score was clean and bright. Effects presented excellent dynamics and clarity. Distortion created no problems even during the loudest parts, and highs appeared crisp and vibrant. Low-end response was nicely deep and tight, as bass elements really added to some of the more aggressive sequences. The audio worked well enough for a “B+”. As we head to the extras, Trelawney’s Crystal Ball presents five deleted scenes. They last between 30 seconds and 115 seconds for a total of four minutes, 47 seconds of footage. The most substantial pieces connect to the “Sir Cadogan” painting and his role as guard. Otherwise, we only see very minor bits, so don’t expect much from these clips. Inside Creating the Vision, we get an 11-minute and 45-second piece. 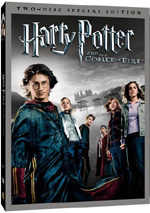 It mixes behind the scenes shots, movie clips, and comments from producers Chris Columbus, Mark Radcliffe and David Heyman, screenwriter Steve Kloves, director Alfonso Cuarón, author JK Rowling, and production designer Stuart Craig. They talk about the adaptation of the books, Cuarón’s ideas for the flick, its various design components, staying true to the Potter universe, and the inspirations for some of the flick’s creatures. Mostly the program follows a “bringing the books to life” tone with a very praise-oriented focus. We hear lots of talk about how wonderful everything is and don’t really learn very much about the movies. Head to Shrunken Head offers a collection of cast and crew interviews. It starts with a 40-second introduction from British TV personality Johnny Vaughn and “Shrunken Head”. We then find comments from “The Heroes” (Daniel Radcliffe, Emma Watson and Rupert Grint), “The Gryffindors” (James Phelps, Oliver Phelps, Devon Murray and Matthew Lewis), “The Slytherins” (Tom Felton, Jamie Waylett, and Josh Herdman), “Professor Lupin and Sirius Black” (David Thewlis and Gary Oldman), “Professor Dumbledore and Rubeus Hagrid” (Michael Gambon and Robbie Coltrane), “The Dursleys” (Richard Griffiths, Harry Melling, Fiona Shaw and Pam Ferris) and “The Filmmakers” (Cuarón, Craig, and director of photography Michael Seresin). All together, these fill 42 minutes and 51 seconds. The “Heroes” talk about their preparation for the third movie, their experiences with fame, their biggest fears, and what Potter powers they’d like in real life. The “Gryffindors” chat about their casting, what other characters they’d like to play, film-related experiences, their fears, and the powers they wish they had. The “Slytherins” cover reactions in daily life, perks on the set, and silly questions asked by fans. When we meet “Lupin/Black”, they discuss what they knew about Potter before this film, reactions from Oldman’s kids, their characters and why they wanted to appear in the movie, working with the established cast and crew, Thewlis’s wolf transformation, and what animals they’d be. “Dumbledore/Hagrid” examines approaches to the material, how they make Hagrid look large, reactions from children, and working with the kids. “The Dursleys” discuss reactions from fans and relatives, their characters, and what powers they’d like to have. Finally, “The Filmmakers” go over how Cuarón tried to make this flick his own, shooting in Scotland, designing various elements and challenges, costumes, and the tone on the set. The interviews mix in some good data, and it’s interesting to hear how the actors deal with fans in real life. The filmmakers also offer nice notes about their plans and decisions. However, an awful lot of fluff shows up here with many inane questions. The participation of “Shrunken Head” in the proceedings makes matters even goofier. These are sporadically useful interviews but they lack consistency. Choir Practice is just a “sing-along” feature. It shows movie clips along with a version of “Something Wicked This Way Comes” as heard in the flick. Yawn! Care of Magical Creatures offers a four-minute and 40-second featurette about the movie’s animals. We hear from Columbus, animal supervisor Gary Gero, head trainers Julie Tottman and Dave Sousa, animal trainer Jim Warren, They chat about the flick’s critters as they tell us about their work and training. It’s too short to offer much substance, but I like it; the bit that shows how they mess up the normally well-groomed Crookshanks is especially fun. With Conjuring a Scene, we get another featurette; this one runs 15 minutes and 30 seconds. It presents remarks from Oldman, Thewlis, Heyman, Cuarón, Craig, Seresin, Mark Radcliffe, Columbus, chief makeup designer Amanda Knight, chief hairdresser Eithne Fennell, creature and makeup effects designer Nick Dudman, visual effects supervisors Roger Guyett and Tim Burke, lead animator Steve Rawlins, digital effects supervisor Euan MacDonald, CG supervisor David Lomax, animation supervisor Mike Eames, special effects supervisors Stephen Hamilton and John Richardson, and actor Timothy Spall. They discuss the physical look for Black, Lupin’s werewolf transformation, Pettigrew’s change from rat to human, creating the dementors and the hippogriff, shooting actor interaction with the CG creatures, animatronics, building the Shrieking Shack and the Knight Bus, and shooting in Scotland. “Conjuring” rips through its various topics quickly but it looks at them with reasonable depth. We learn a little about a lot in this brisk and informative piece. Finally, the disc includes three trailers. We get clips for Azkaban as well as for the first two Potter films. With Harry Potter and the Prisoner of Azkaban, we get a film with a lot of similarities to its two predecessors. Nothing here will turn off established fans, but nothing will entice non-partisans to embrace the Potter franchise. It’s another moderately entertaining movie without much to make it truly special. As for the Blu-ray, it provides exceptional visuals and very good audio, but the supplements don’t add a ton to the package; they’re decent but not up to the level I’d expect for such a prominent release. The Prisoner Blu-ray does the most important parts right, as visuals and sound are strong, but the insubstantial collection of bonus materials makes it a disappointing release.